The center of your meal. Alphabets with Mini Meatballs - by Cathy Lea. American Chop Suey - by Kate. Best Butter Chicken - by Sandra K.
Broccoli with Pasta and Sun Dried Tomatoes - by Cathy Lea. Camper Van Cottage Pie - by Cathy Lea. Campfire Packets - by Jillian Dal Bello. Capitol Reef Casserole - by Cathy Lea. Charcoal Grilled Lamb Chops - by Charles Henry. Cheeseburger Deluxe Salad - by Cathy Lea. Cheesy Spaghetti Stovetop Casserole - by Cathy Lea. Chicken, Mashed Potatoes and Noodles - by Williamsburg Rally Attendees. Chicken ala King - by Williamsburg Rally Attendees. Chicken And Broccoli Alfredo - by Cathy Lea. Chicken and Dressing Casserole - by Cathy Lea. Chicken and Rice - by Roadtrek Chapter Member. Chicken Chow Mein - by Cathy Lea. Chicken Diablo - by Cathy Lea. Chicken Divan Stovetop - by Cathy Lea. Chicken Potato Hash - by Marcy Dowse. Chicken Stroganoff - by Williamsburg Rally Attendees. Chicken Tetrazzini In A Pan - by Cathy Lea. Chicken with Chow Mein Noodles - by Williamsburg Rally Attendees. Chicken With Red Curry Sauce - by Cathy Lea. Chicken with Sun Dried Tomato Cream Sauce - by Cathy Lea. Chile Verde (Green Chile) - by Cathy Lea. Chili Pasta No-Bake - by Betty. Chinese Chicken Salad - by Barb Anderson. Cola Chicken - by Williamsburg Rally Attendees. Creamy Beef And Mushroom Noodles - by Cathy Lea. Creamy Chicken Tarragon - by Marie Burton. Crock-Pot Chicken Stew - by Wendell Nunes. Crock-Pot Pork Chops - by Jean Dube. Cuban Pork Roast - by Maribel Penichet. 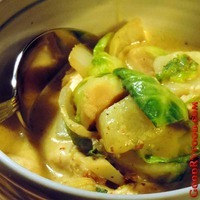 Curried Brussel Sprouts And Chicken - by Cathy Lea. Dashboard Pasta Puttanesca - by Kate. Dijon Mushroom Chicken with Wine Sauce - by Barbara B. 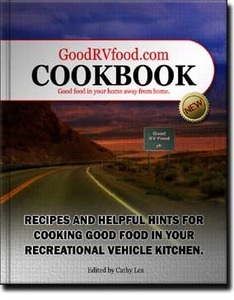 Easy Swedish RV Meatballs - by Cathy Lea. Enchilada Casserole - by Allisa Imming. Grilled Salmon with Dijon Maple Glaze - by Barbara B. Ground Beef and Noodles in Sour Cream - by Roadtrek Chapter Member. Ham and Scalloped Potatoes - by Williamsburg Rally Attendees. Hamburger Stroga-not - by Cathy Lea. Hawaiian Ham - by Rose and Rognar Doerwald. Jalapeno Green Onion Quesadilla - by Cathy Lea. LazyTacos - by Barbara Dalderis. Lemon Cream Shrimp Pasta - by Cathy Lea. Low Mess Tacos - by Tim B.
Lowcountry Shrimp and Grits - by Cathy Lea. Mac and Cheese with Roasted Green Chile - by Cathy Lea. Macaroni Hamburger Skillet - by Ethel H.
Margie's Pasta Primavera - by Margie Tetmeyer. Meaty Rice and Beans - by Steve Rance. Mediterranean Chicken Packets - by Peter Kafer. Mediterranean Chicken Pasta - by Cathy Lea. Mexican LobLolly - by Larry Braud. Mexican Philly Cheesesteak Casserole - by Cathy Lea. Minestrone Macaroni - by Roadtrek Chapter Member. Mirin Glazed Salmon - by Marie Burton. Mustard Pork Chops - by Marie Burton. Navajo Stew - by Cathy Lea. New Mexico Red Chile Sauce - Home Style - by Cathy Lea. 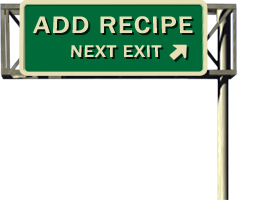 New Mexico Red Chile Sauce - Simple Version - by Cathy Lea. No Fuss Sticky Chicken - by Linda. Noodles Napoli - by Cathy Lea. Pasta and Chile - by Williamsburg Rally Attendees. Pasta Fagioli - by Shirley Henion. Polenta and Greens with Tomato Vodka Sauce - by Cathy Lea. Pork Tenderloin With Rosemary Cream Sauce - by Peter Kafer. Pot Roast Patties - by Cathy Lea. Queso Mac and Broccoli - by Cathy Lea. Ranch Beef and Noodle Skillet - by Roadtrek Chapter Member. Raspberry Glazed Pork Chops - by Barbara B.
Sauerkraut and Dumplings - by Cathy Lea. Sausage and Potato Stovetop Casserole - by Sharon McClung. Shiprock Shepherds Pie - by Cathy Lea. Simple Fish Filets - by Denise Gilgen. Skillet Southwest Chicken - by Candace Rapf. Slowcooker Salsa Chicken - by Lori DeWitt. Smoked Sausage Jambalaya - by Williamsburg Rally Attendees. Southern Sausage - by Rose and Rognar Doerwald. Southwest Chipotle Chicken Pasta - by Cathy Lea. Spaghetti-Pizza Sauce - by Gerry Boudreau. Spaghetti with Clam Sauce - by Carol Lyke. Spicy Black Bean Surprise - by Williamsburg Rally Attendees. Spicy Cruciferous Stir-Fry - by Caring4Cancer community. St. Patricks Day Teriyaki Meatballs - by Casey. Stacked Cheese Enchiladas - by Cathy Lea. Stovetop Mac and Cheese - by Roadtrek Chapter Member. Tricolor Pasta with Peas and Brie - by Cathy Lea. Tuna And Grits - by Peter Kafer. Tuna Casserole - by Cathy Lea. Uncle Matt's Chile - by Steve Fishwick. Unstuffed Peppers - by Cathy Lea.